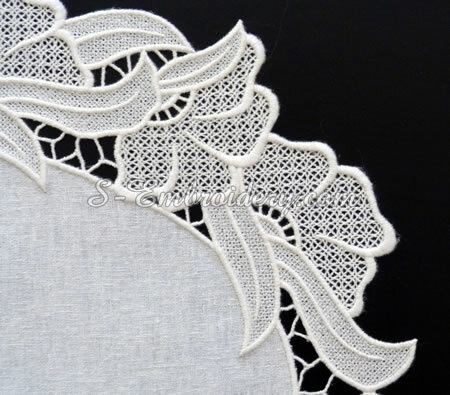 This beautiful free standing lace ellipse machine embroidery doily is created "in the hoop", using the so called "assemble as you stitch" technique. The design has three parts. The size of the largest one is 5.66 x 9.36 inches (143.8 x 237.8 mm) and the number of stitches for that part is 37,466. 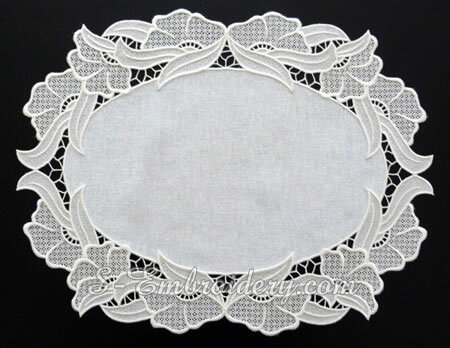 The size of the finished doily would be approximately 14.8 x 18.2 inches (37.8 x 46.2 cm). You receive 4 machine embroidery files - the 3 design parts and another file which contains the marker stitches that are need for proper alignment and seamless assembly of the design components. You will also receive 2 PDF files - one is file with design information and the other contains the instructions for creating the free standing lace doily, we have featured on our web site. 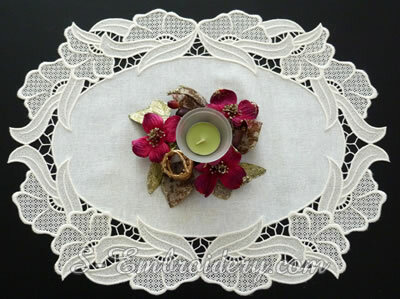 Notes: In addition to the usual materials for creating a free standing lace doily for this one you will need adhesive spray (or glue stick), as well as a suitable base for assembling the parts of the design. It should provide enough support for pressing 2 pieces together after using the glue, but at the same time allow to easily stick a pin. A cork tile may be just what you need. 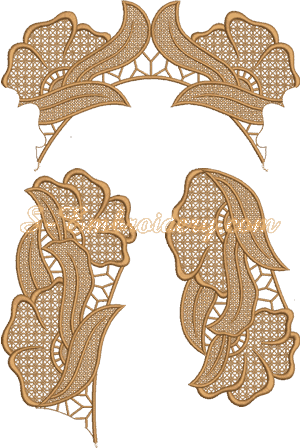 If you are new to doing free standing lace embroidery in the hoop and you are not sure what procedures might be involved, you may want to have a look at the instructions for creating the free standing lace floral ellipse that come with this machine embroidery design. 10615 absolutely beautiful. easy to follow instructions. Thanks for a great design.